Agriculture holds strong in New Jersey. With 9,100 farms across 720,000 acres of land, the Garden State grows everything from cranberries to Christmas trees. In fact, in terms of fruits and vegetables, it is leading the pack, ranking in the top 10 in the country for cranberries, bell peppers, spinach, blueberries, peaches, cucumbers, squash, tomatoes, apples, sweet corn and snap beans. Beyond produce, the Garden State represents its namesake with a $455 million horticulture industry, consisting of nursery and greenhouse products, sod and Christmas trees. In 2012, the value of sales for floriculture crops such as bedding and garden plants, cut flowers and foliage plants totaled just over $176 million. Bedding and garden plants alone brought in $109 million. New Jersey agriculture – the state’s third-largest industry – continues to grow steadily, ensuring the Garden State will continue to be an agricultural powerhouse for years to come. New Jersey businesses source local products to benefit farmers and consumers. Homegrown By Heroes program helps New Jersey's military veterans promote their agricultural products. Use this handy, helpful New Jersey produce calendar to find out when fruits and vegetables are in season throughout the year. Annual New Jersey State Agricultural Convention guides New Jersey Department of Agriculture policies. Official Jersey Fresh stores sells merchandise of New Jersey Department of Agriculture campaign. New Jersey's turfgrass industry thrives and adds to the state's economy. New Jersey is at the forefront in ensuring food safety. 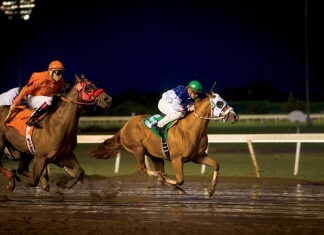 Oklahoma is home to three licensed racetracks. Learn more about each.